Lately I've run into enough former students to remind myself I’ve been teaching for 38 years (counting back to my first volunteer assignments while still at UCLA). I reckon some 2000 students have passed through my classes, some of whom are now well entrenched in middle age. I always enjoy seeing or hearing from them. I'd already been thinking of a blog series on some of those former students when one showed up today to dance for an assembly. 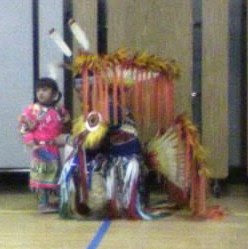 Rene Jaramillo began competitive pow wow dancing several years before he showed up in '77 for some junior high history. 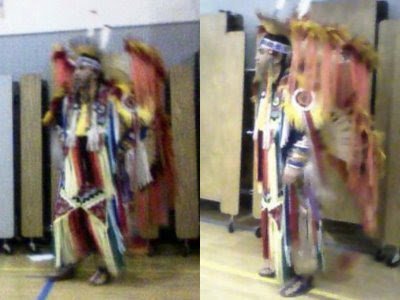 Native American dancing is still his passion, one he shares with his wife and daughter. Between getting my current class seated and the beginning of the performance, Rene and I had a moment to renew our acquaintance and ask about mutual friends. I was kicking myself for not bringing my camera, when I remembered a function on my cell phone that I haven’t even played with after a year of carrying it around. In the low light, Rene’s fast dancing gets totally lost, but the stills are recognizable, if not quite satisfactory. As I begin this occasional series on former students, Rene represents my 7th grade World History class of ’77-’78, and the 8th grade U.S. History class of ’78-’79, my first full time job. We also enjoyed some great recess basketball. Rene currently works at a Sports Chalet and has danced for audiences across the U.S. and Europe. Next time, I’ll try and have a camera that can catch the action.